I'm currently living in a campervan and travelling around Australia, with extended stays in interesting locations. After 20 years in the public service I now provide a range of freelance services. How can I do this while I'm travelling? Why do I use the name isDon? I use the term 'images' rather than 'photos' as some of my images have been digitally manipulated, or are digital creations. While they all have a photographic beginning, I believe it is misleading to call all of them photos. Most of my images are for sale - or if you have particular needs I can go out and take the shots you require. My images are categorised by geographic location and by subject category. 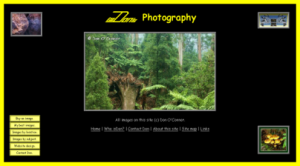 Thumbnails are provided for each image, clicking on the thumbnail displays a larger image with details of the image and buttons to scroll though other images of the selected category. You may also view a selection of what I consider my best images. 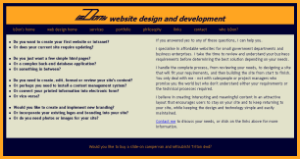 I build affordable, interesting and meaningful websites for small businesses and government departments. I take the time to review and understand your business requirements before determining the best solution depending on your needs. I believe in creating interesting and meaningful content in an attractive layout that encourages users to stay on your site and to keep returning to your site, while keeping the design and technology simple and easily maintained. 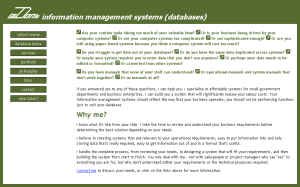 I build databases or business systems for small businesses or government departments. As a sole-operator I can build you a simpler, cheaper, more effective system that's solid, reliable and easy to use. I can also train you or your staff to maintain it. I've been building database systems for over 20 years - from the point of view of a user as well as a programmer and developer. 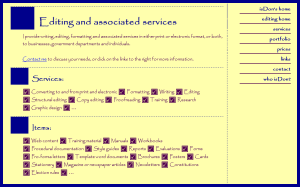 I can write, edit, proofread, format or design information in a variety of forms. I target your information to ensure that it will be understood by its intended audience, recognising the differences between the way users read printed and electronic information. If you're wanting a website built, or a document edited, these are easily done via the internet no matter where I am. If you want one of my photos, or want me to go out and take a particular shot for you, this can all be arranged electronically. If you need a database system, much of the work can be done remotely, and I can come to you when required. I have no set travel plans, so I can generally travel to wherever I'm required for a particular job. I'm more than happy to extend my stay in a nice area to enable me to complete an interesting job. I'm still in contact electronically while I'm travelling. I'm usually able to check my phone messages at least daily and my email usually every few days, or I can ensure I'm within email range when required. Contact me if you want one of my images for your magazine or to hang on your wall, or you want me to take photos for your next promotional calendar, or maybe you have a report you want formatted and edited or would like a new promotional brochure for your business, or perhaps you need a new website or even if you need a database programmer for 6 months . . .